Get all 3 of my FIT packs for a discounted price! 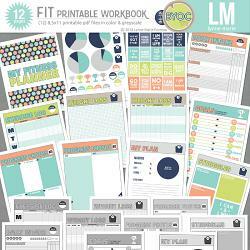 Don't miss the coordinating printable workbook! A digital scrapbook pocket card pack by Becca Bonneville, My Happy Place feature fresh colors, unique illustrations and great mix of journal and filler cards. This card pack matches the My Happy Place collection perfectly as well as the rest of the April '18 BYOC. My Happy Place card pack includes 8-3x4 cards and 2-4x6 cards in both orientations. A digital scrapbook element pack by Becca Bonneville, My Happy Place feature fresh colors, unique illustrations and versatile embellishments. This element pack matches the My Happy Place collection perfectly as well as the rest of the April '18 BYOC. A digital scrapbook paper pack by Becca Bonneville, My Happy Place feature fresh colors, unique illustrations and versatile patterns. This paper pack matches the My Happy Place collection perfectly as well as the rest of the April '18 BYOC. My Happy Place includes 15-12x12 patterned papers and 8-12x12 solid papers for a total of 23 papers. If you love all retro things you will love these Retro Slides Frames! A collection of 7 cool slide frames, that coordinate with the April 2018 BYOC, to use in your pages! A collection of 52 cool images, that coordinate with the April 2018 BYOC, to use in your pages! A collection of 10 cool papers, that coordinate with the April 2018 BYOC, to use in your pages! 12 printable pdf files in both color & greyscale. Also includes png file stickers & motivational quotes. Part of the April 2018 BYOC collection. Don't miss the coordinating FIT papers, elements & journal cards. Includes 90+ embellishments - papered bits in multiple styles, doodles, bits, word art, strips, and more!